Dr. Stone a Chiropractor in Nobliesville near Fishers and Carmel focuses on wellness chiropractic care, family chiropractic, pre-natal chiropractic, joint therapies, plantar fasciitis and more, our chiropractor works to keep you and your whole family healthy and strong each and every day. CHAMP Chiropractic offers a variety of massage techniques: swedish massage, deep tissue massage, and sports massage. CHAMP Chiropractors don’t just adjust. CHAMP is a chiropractic wellness center that focuses on YOU. A chiropractic visit at CHAMP is never just a routine adjustment sometimes your visit may not even include an adjustment. Dr. Ian focuses on your individual biomechanics. 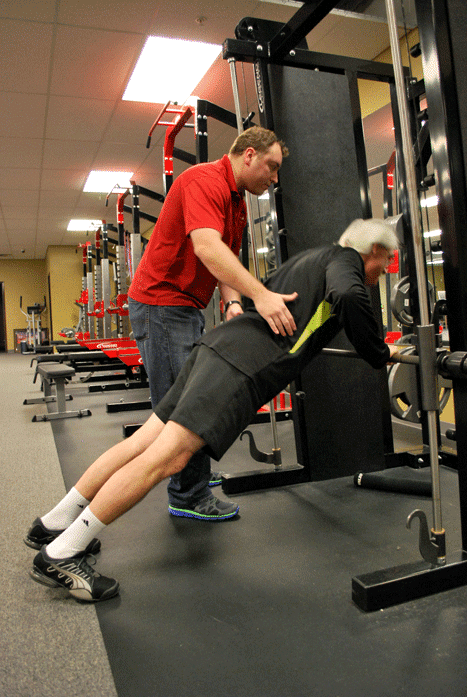 He will perform a functional movement screen to learn about your deficiencies and develop a treatment plan that will make you perform and feel better. Chiropractic visits at CHAMP often include soft tissue or muscle work like GRASTON, ART, Massage Therapy or Cold Laser. CHAMP Chiropractors believe and practice the belief that an adjustment without muscle therapy isn’t enough to eliminate pain and heal an injury. CHAMP’s philosophy for chiropractic adjustments is to review your individual biomechanics, stabilization and mobility of the joints. Dr. Ian Stone integrates soft tissue work/ muscle work, manipulation, and rehabilitation for a comprehensive chiropractic treatment. For the convenience of our clients CHAMP Chiropractic provides direct insurance billing with major insurance providers, medicare and medicaid. CHAMP also is the home gym for an additional five personal trainers.Learn more by visiting our personal training page.